Dunes, Shadows, Morning. © Copyright 2019 G Dan Mitchell – all rights reserved. 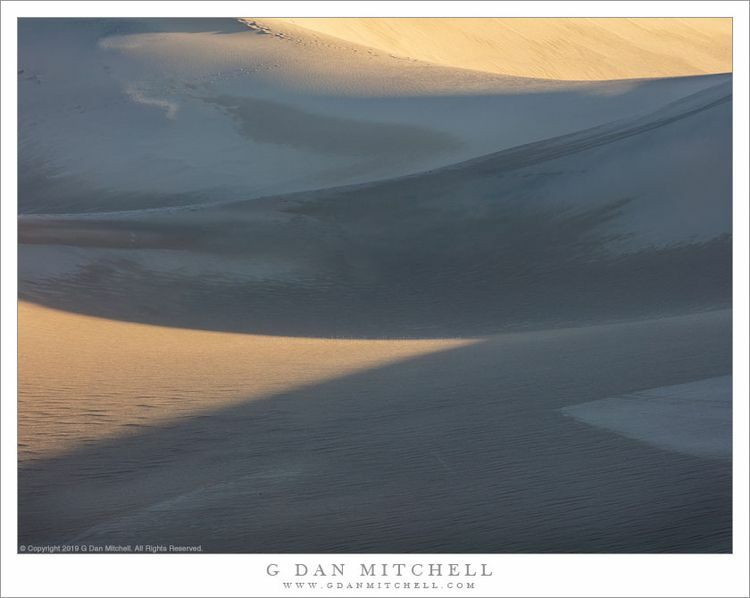 Patterns of morning light and shadows on dunes, Death Valley National Park. In the dunes you find yourself in a veritable photographer’s laboratory of of shapes, juxtapositions, textures, and colors. And it is not static scene either when you are there very early or very late in the day — the light changes quickly. Dusk light lends brings softer light and lens a blue cast to the scene. When the sunlight first arrives there can be stark differences between brightly lit highlights and deeper shadows with cooler tones. Before long the colors began to fade and the scene can become more subtle or even nearly monochromatic. When I made this photograph, warm and color-saturated light was coming across the top of the dunes, but the light in the shadows, still mainly from open sky, was of a cooler blue color.